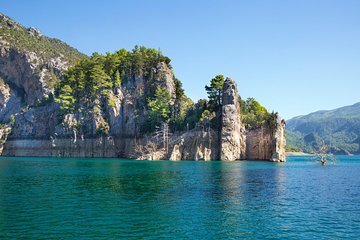 Embark on a memorable boat tour through Turkey’s Green Canyon on this full-day tour, departing from Alanya. Meet your friendly local guide in Alanya, then venture to to the Green Canyon, where you’ll kick back in a comfortable boat and set off on a scenic cruise across the Green Lake. Admire the views of woodlands and dramatic mountains as your guide tells you about the history of this region.